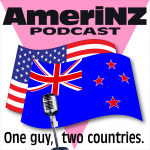 » AmeriNZ 336 – Still waiting AmeriNZ Podcast: One guy, two countries. The New Zealand General Election happened, but we don’t have a government yet. That’s my first, and main, topic today. I also talk a bit about a big commemoration of a famous battle in World War One. I have unusual feelings about it. No user commented in " AmeriNZ 336 – Still waiting "